We specialize in boiler services. Keeping your property safe and warm is never an easy job, however with the best boiler service in London at your doorstep, at least one aspect of property maintenance is easier than ever. Get a boiler service from £75. Our specialists are dedicated to supplying reputable, hassle-free service that keeps your home running flawlessly, without interruption to your family’s busy lifestyle. If problems arise, we provide emergency boiler services 7 days a week, giving you the comfort that comes with an understanding there is always an experienced and well-informed specialist on your side. Our boiler service team can install a new combi and system boiler, full routine maintenance or quickly handle any emergency boiler services. We can complete any size job, fulfill any specifications, and respond to any questions that you may have regarding boiler systems. Whether you are experiencing a system failure or you are down for prepared maintenance, we are always ready. Our top interest is to react quickly to every service call and resolve the problem in a promptly and cost effective manner. There is a broad range of products and services planned to provide peace of mind the possibility of your central heating, gas boiler or electricity supply being interrupted or breaking down. Boiler service costs will vary depending on your location, boiler age, make and model. Usually, a full service of your boiler will cost from £50 to £85 for a standard efficiency boiler and from £80 to £160 for a high-efficiency condensing boiler. Our boiler service team often charge more than in rural areas. Call Cenultra today for your boiler services to ensure you get the best price possible. Domestic gas boiler services from £75. Commercial gas boiler services from £150. All our prices subject to VAT. Pressure check to make sure the gas boiler is operating at the correct pressure. A flue test to ensure there are no dangerous emissions from your boiler. Check your boiler and control to make sure they are running safely. Visually inspect the boiler to look for deterioration and leaks. Leave a report with you supplying info about boiler safety. Alpha Heating Innovation, Baxi Heating UK Ltd, Ariston Boilers, Biasi UK Ltd, Chaffoteaux & Maury, Buderus, Glow-worm Boilers, Ideal Boilers, Heatline, Ravenheat, Keston, Potterton, Vaillant Ltd, Saunier Duval, Viessmann Ltd,Worcester Bosch Group and Vokèra Ltd. It is necessary to have your boiler serviced once a year to decrease the threat of carbon monoxide gas poisoning and the boiler breaking down at an inappropriate time of year – when its most used, the winter. The cost includes labour and any call out charges that were paid unless specified otherwise. Get your boiler services urgently, if you discover any of the warning signs listed below:. Your home appliance is burning with an inactive yellowish flame instead of a crisp blue flame. You can see stains and black marks on or around gas appliances. There is an increased condensation in your house. The pilot burner keeps going out. Carbon monoxide poisoning can be fatal and is caused by poorly maintained gas appliances. It is essential that you get your boiler and gas appliances examined and serviced annually to ensure they are working as firmly and effectively as possible. Magnetic filters and Lime-scale reducers are a must when connecting a new boiler to an existing system. The Magnetic filter is cleaned out as part of a boiler service. Most manufacturers, including of leading brand names Vaillant and Worcester Bosch, recommend having your boiler serviced a minimum of once a year. Getting a yearly boiler service from the gas safe register is normally a condition of any service warranty on a new boiler and regular boiler maintenance provides a number of significant benefits that can ultimately save you money. In addition to the boiler itself, the engineer should check other aspects of the central heating system to make sure that they are running fully. This includes of checking growth tanks on high pressure systems. It is also a great idea to have any TRV’s (Thermostatic Radiator Valves) examined to ensure they are not sticking. 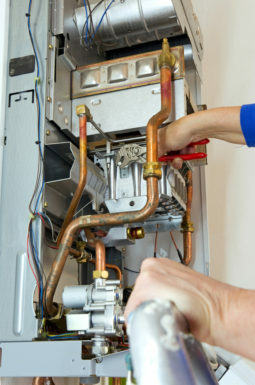 If you do not have TRVs installed, then the boiler service is an excellent opportunity to have them fitted. When we do any boiler repair work or service job we take unique care to remember of items that might have collected around the boiler in time. This is usually more of an issue in houses where people keep things besides a boiler in the basement. These products that accumulate around the boiler might not just affect its performance, however might present a safety threat. For instance, if the flue of the boiler ends up being blocked, we will investigate this when we perform a boiler service or repair task. Whether you need repairs or boiler service on your old boilers or you require a new boiler replacement, let our proficiency help you with requirements and options. We offer extensive experience and a total range of boiler services in the business and domestic boiler industry. Who needs a gas safety certificate? Do Landlords Need a New Gas Safety Certificate For Every New Tenant? Do I need a gas safety certificate when selling a house or a flat?